Anticipation mixed with pleasure as I read a sign that announced our arrival in Bhuj, headquarters of the Kutch district. I was finally going to the land of my ancestors after many years. Over a period, I had heard about Bhuj & the region of Kutch from my various relations & though I had visited Mandvi (another town in Kutch), travel to Bhuj had eluded me. Bhuj has witnessed a tumultuous history of earthquakes & civic troubles but had risen up resiliently every time. In fact, the 2001 massive earthquake caused heavy damages to life & property. Would the markets of Bhuj after so many ups & downs still hold promise? I would soon find out. Though, I had heard praises about the varied delicious street food available at Bhuj, I was unsure about the markets. 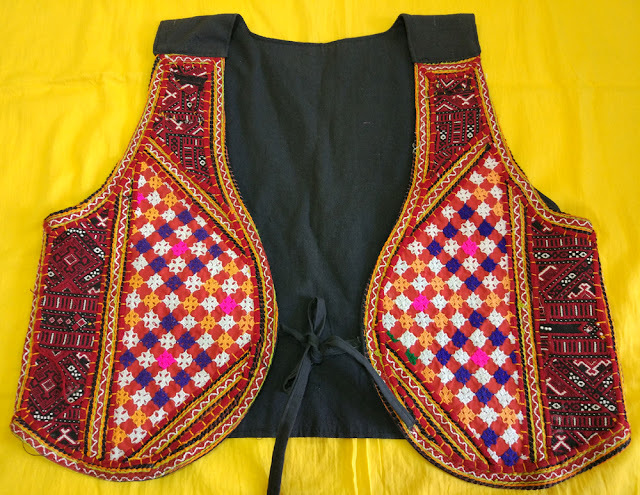 As, I went around the by-lanes of Vaniyavad & Saraf Bazaar, I had no doubt that the pleasing melange of colors & handiwork available at Bhuj was worth the visit. Shops after shops vie for attention at Vaniyavad, one of the busiest markets in Bhuj. 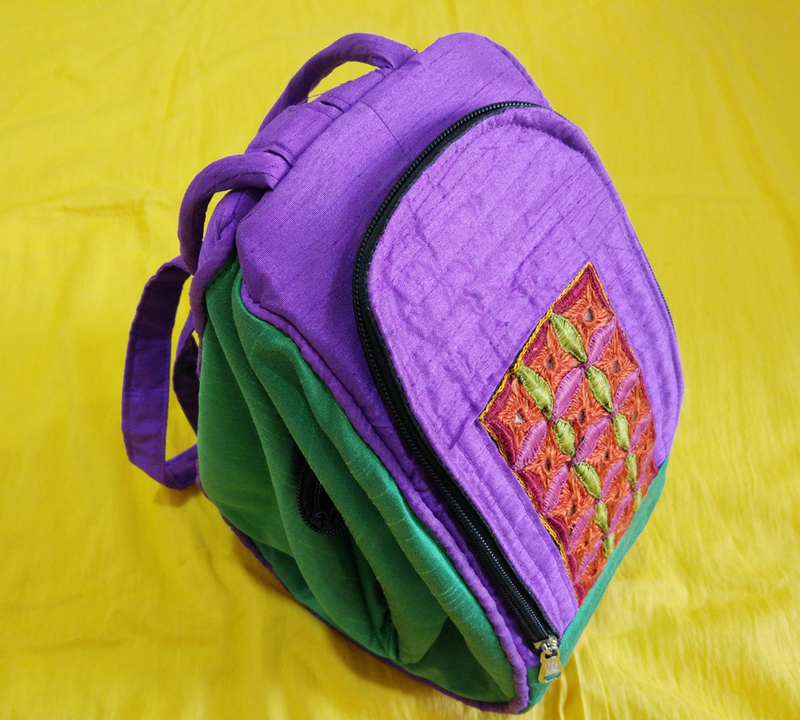 Ethnic handcrafted products can be found in abundance here. Artisans from in & around areas from Bhuj brings their products for sale here. Beautiful hand embroidered quilts (starting from INR 2000), embroidered garments for men & women- especially colorful ensembles like Chania cholis (hand embroidered start from INR 7000), kutchi blouses, Kurtis & more for women & embroidered jacket & caps for men can be bought. Home décor items like cushion covers (INR 300 onwards), wall pieces (INR 700 onwards), torans (door hangings) & bed sheets are also available. We saw a variety of handbags & fell in love with these little wonders. 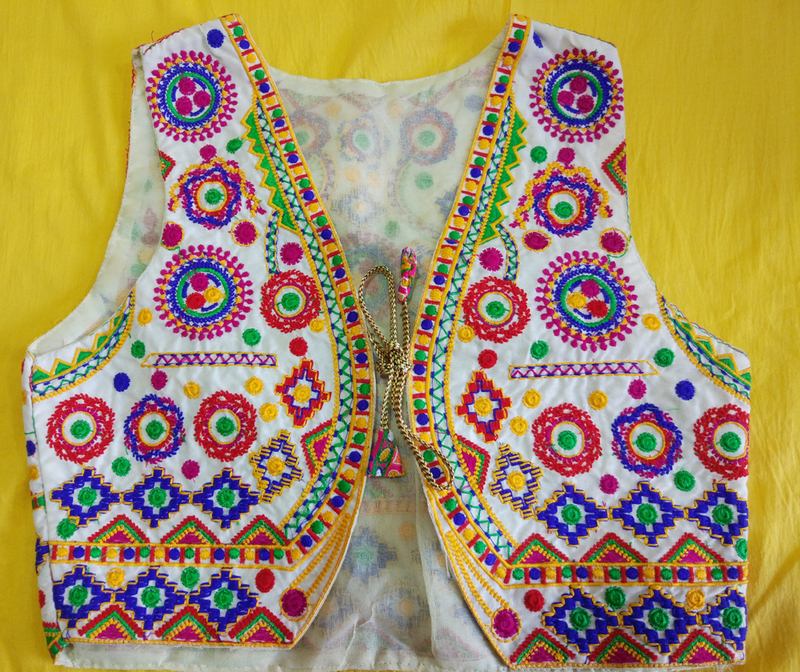 Available in all shapes & sizes with intricate Resham (thread), mirror & bead work they were worth a buy. We saw an interesting mix of traditional Rabari work on leather & picked it up to pair it for a fun fusion look. Be ready to bargain. 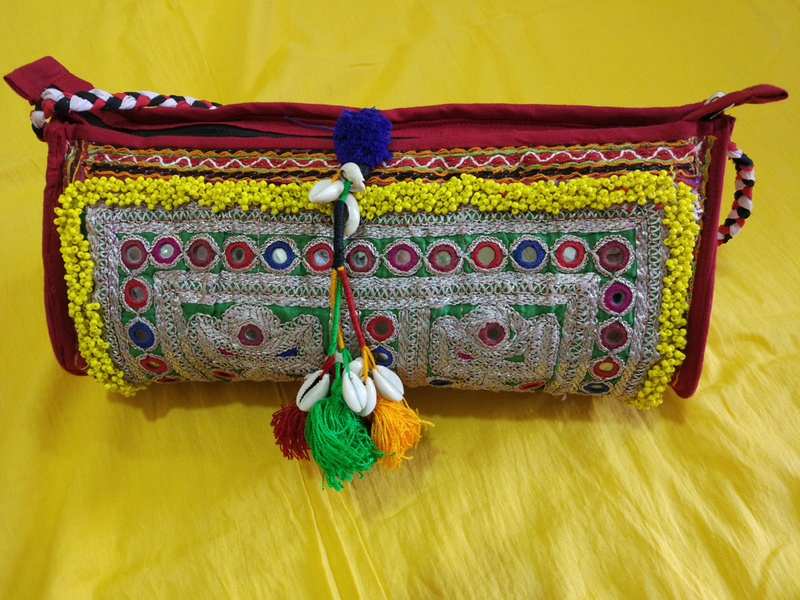 Another good buy are hand embroidered Kutchi shawls & stoles, available at Bhujodi. 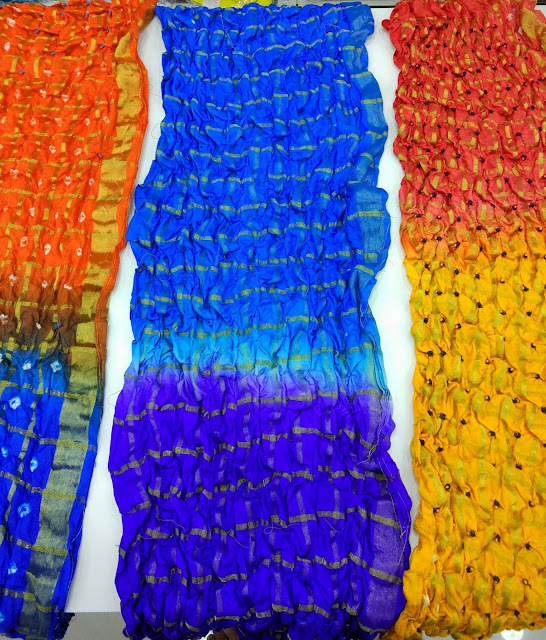 A few stores also sell colorful Bandhani sarees in vivid colors. One can also shop at Old City Market if time permits. 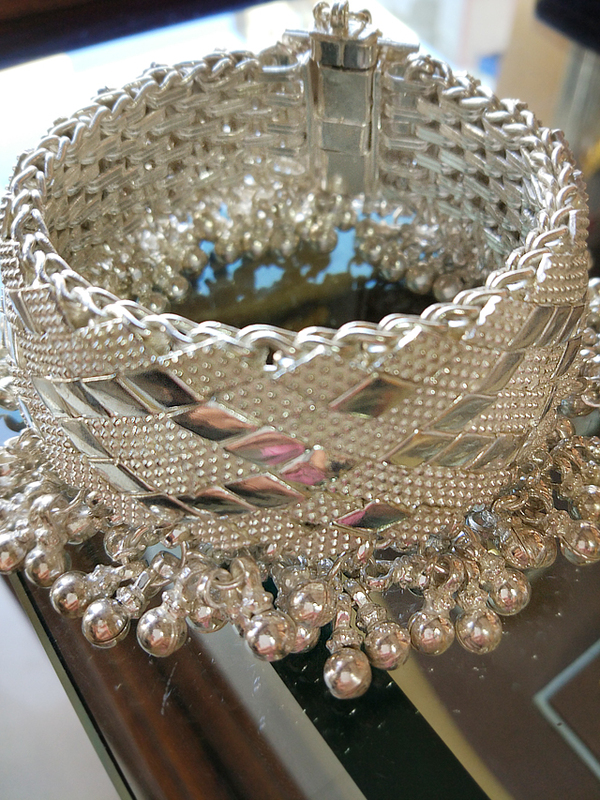 A mecca for silver lovers- Jewellery & artifacts alike. 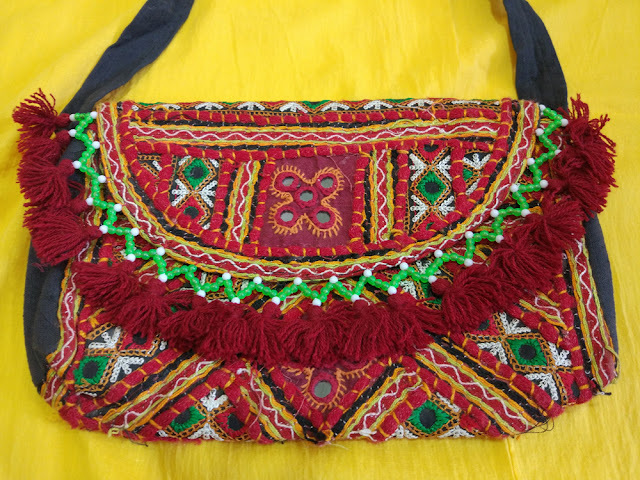 Though the tribal women of Kutch buy their silver Jewellery from in house jewelers of villages like Hodka, Banni, Khavda & more, tourists like us can head to Saraf Bazaar for feasting their eyes on intricate silver items. 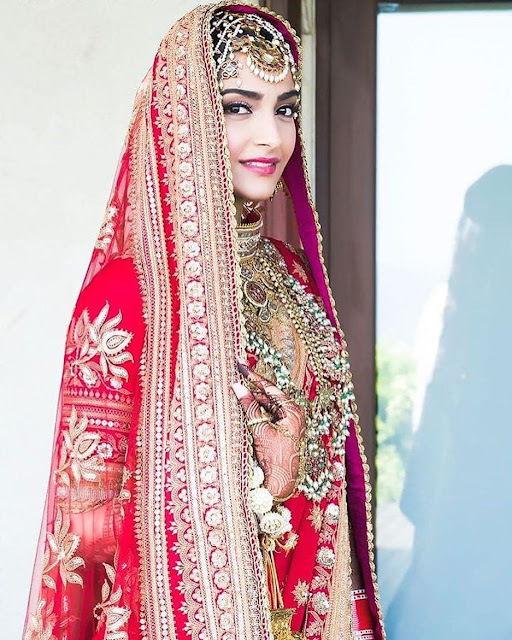 For many communities across Kutch, wearing silver is a mark of identity & individuality and is considered more than embellishment. Its a form of investment, worn with pride & guarded with a watchful eye. Few shops sell tribal Jewellery- bangles, earrings, anklets & necklaces in intricate deigns embellished with beads & embossed work called Meena. Prices start from INR 2000 for bangles & anklets & depend on the design & weight of the piece. 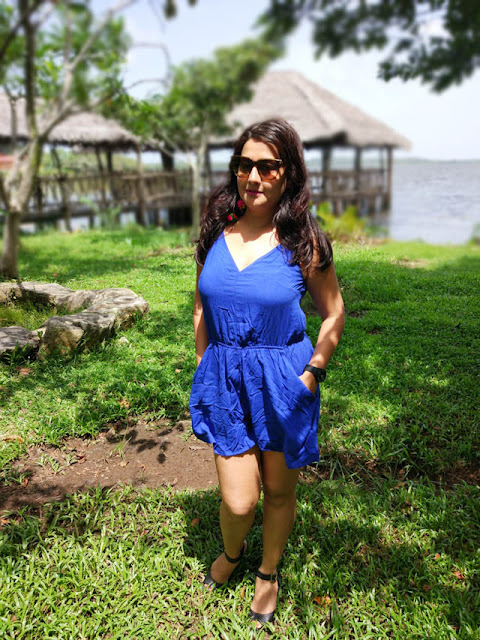 I fell in love with a pair of silver traditional anklet at first sight!!! The delicate work on the anklets culminated into small ghungroos that would make a musical tinkling sound while walking. 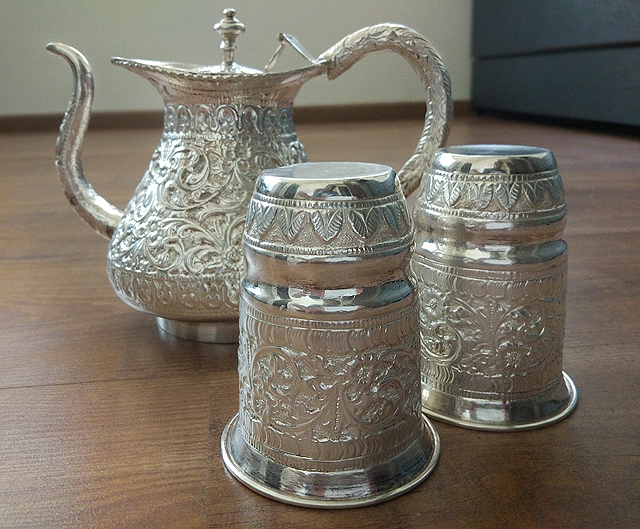 We also found beautifully carved Kalash (a metal pot used extensively during holy ceremonies), silver tea service sets, silver water jug & glasses & more. Though there are other jewelers in & around Bhuj, Saraf Bazaar is a great place to shop for silver Jewellery. I left Bhuj feeling ecstatic after taking in the busy sights & sounds of the markets. The shopkeepers are polite & prepare to have endless cups of tea as they show you their colorful wares.